Preschool Playbook: "On Dasher, On Dancer..."
On the day we had our visit from Santa, we also did some fun reindeer activities. 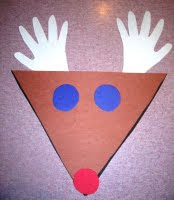 First we made our reindeer with handprint antlers. I always use this reindeer for our Christmas program. 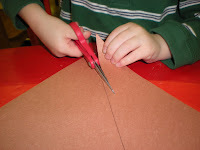 I gave each of the children a piece of paper with a large triangle drawn on it and let the children cut it out. I try very hard to let them do this themselves. I had to correct some hands, but only had a couple that really needed cutting help. Even though some of them were pretty good opening and shutting the scissors, following the lines was a whole other story--notice the tape I had on the table. 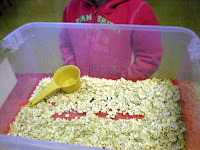 We also made some reindeer food. Last year we used glitter to make this, but I had lots of comments on how the glitter could harm birds, and we should use colored sugar instead. So, this year I did use the colored sugar. 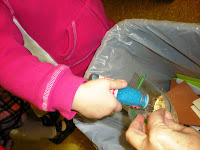 It actually worked out better because we did some tasting as we made the reindeer food. I just let the children pour in the oats, add some sugar, and shake it up. With Santa coming it turned into a very busy day--actually this whole month has been really busy. We only have one more class before Christmas break. It will be great to have some down time. I've already told Mrs. T. when we come back in January we are gearing down to a slow crawl. I think it will be good for everyone. That is such a neat idea. 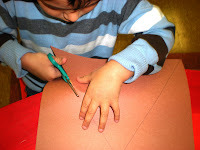 I HAVE to get to the store to get some construction paper so my kiddos can get their craft on! Your posts are always so helpful. 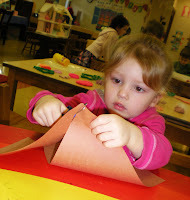 We're going to do this art project today. Thanks. I love that you let them do their own cutting. That's what makes it an art instead of just another craft!